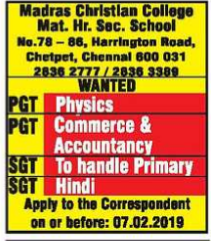 Madras Christian College Matric Hr Sec School,Chetpet,Chennai has advertised for the recruitment of Teaching Faculty- PGT,SGT jobs vacancies. Interested and eligible job aspirants are requested to apply on or before 07/02/2019 .Check out further more details below. Name of the School: Madras Christian College Matric Hr Sec School,Chetpet,Chennai. About School: In the 182 years of existence, we have had a long history of eminent headmasters, qualified and caring teachers, and successful students who have gone on to serve God and Society, and have brought laurels to the school. I can assure you that your child will be well looked after by our dedicated, committed and very skilful staff. How to Apply: Candidates must send their detailed resume to mail to the correspondent on or before 07.02.2019.